Citation THASPIUM BARBINODE (Michaux) Nuttall, Gen. N. Amer. Pl. 1: 196. 1818. 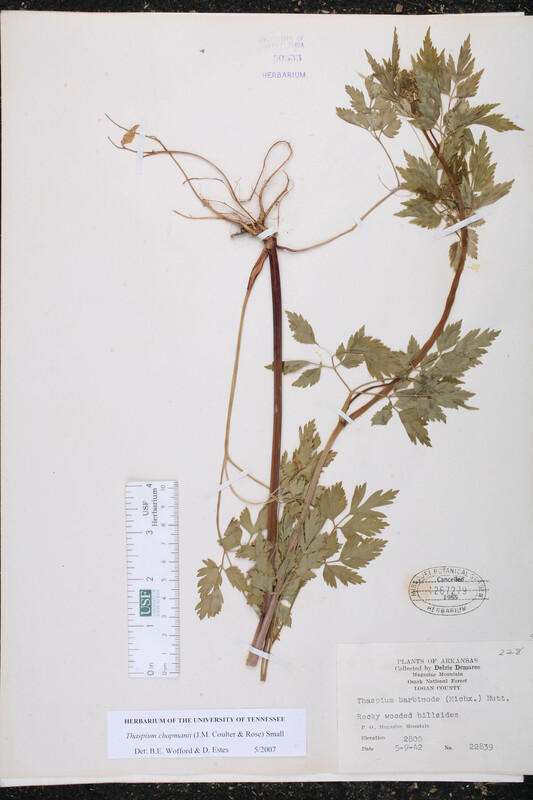 Basionym: Ligusticum barbinode Michaux 1803. 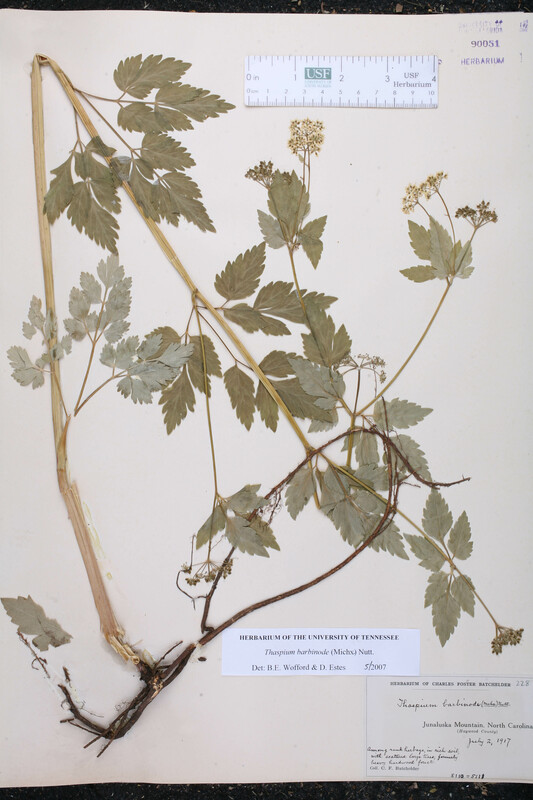 Thaspium barbinode var. 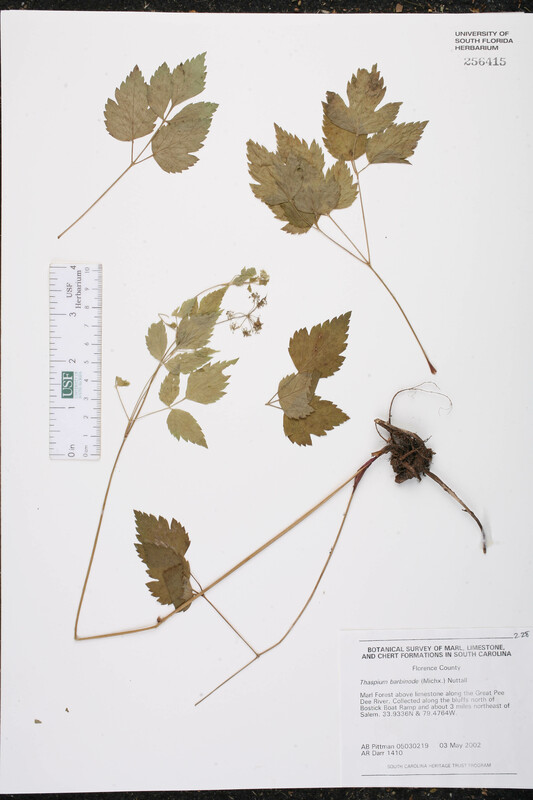 chapmanii Thaspium barbinode (Michaux) Nuttall, var. chapmanii J. M. Coulter & Rose, Contr. U.S. Natl. Herb. 7: 148. 1900, nom. illegit. BASIONYM: Thaspium barbinode (Michaux) Nuttall, var. 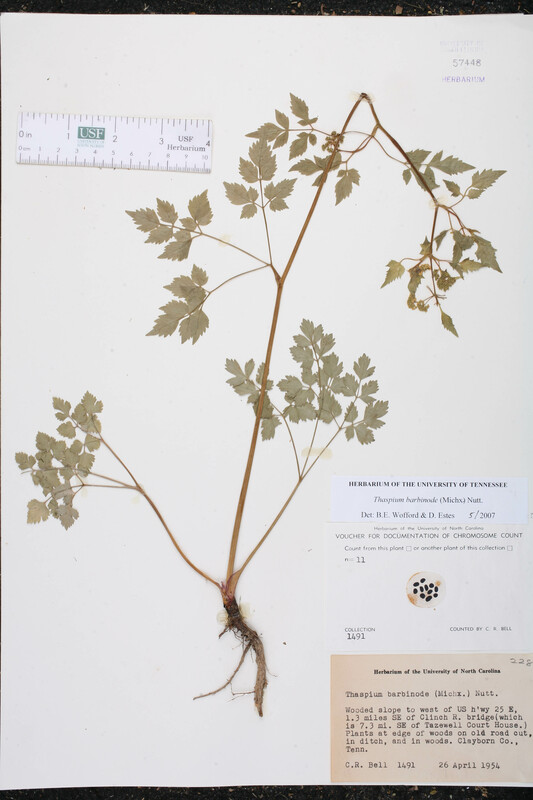 pinnatifidum J. M. Coulter & Rose 1888. Thaspium barbinode var. 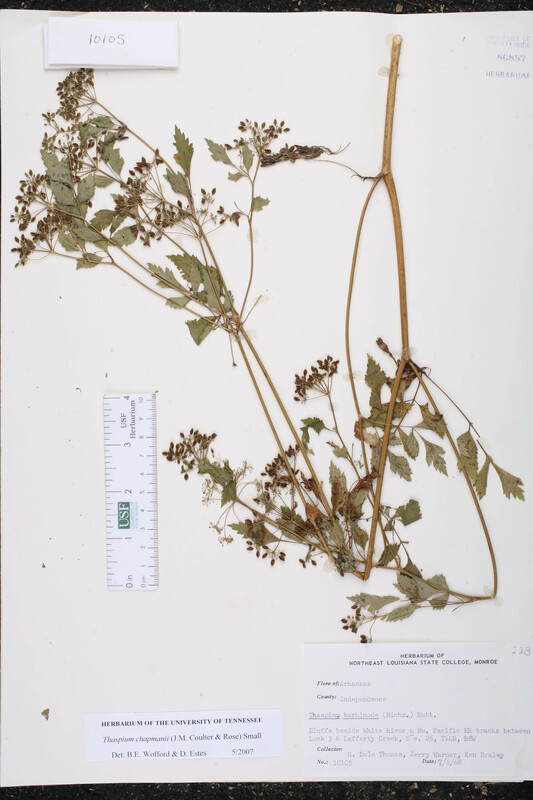 pinnatifidum Thaspium barbinode (Michaux) Nuttall, var. 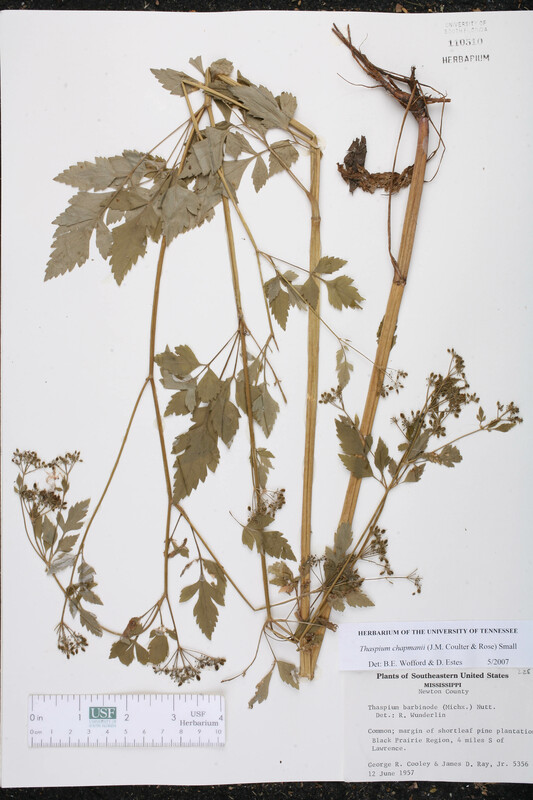 pinnatifidum J. M. Coulter & Rose, Rev. N. Amer. Umbell. 84. 1888. 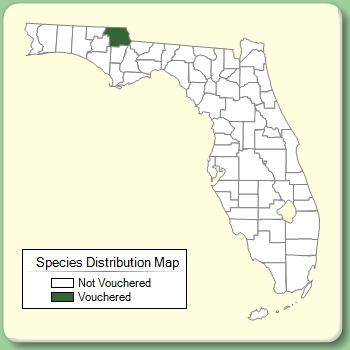 TYPE: FLORIDA: Jackson Co.: Without data, Curtiss 1023 (lectotype: US). Lectotypified by J. M. Coulter & Rose, Contr. U.S. Natl. Herb. 7: 148. 1900. Thaspium chapmanii Thaspium chapmanii Small, Man. S.E. Fl. 980. 1933. 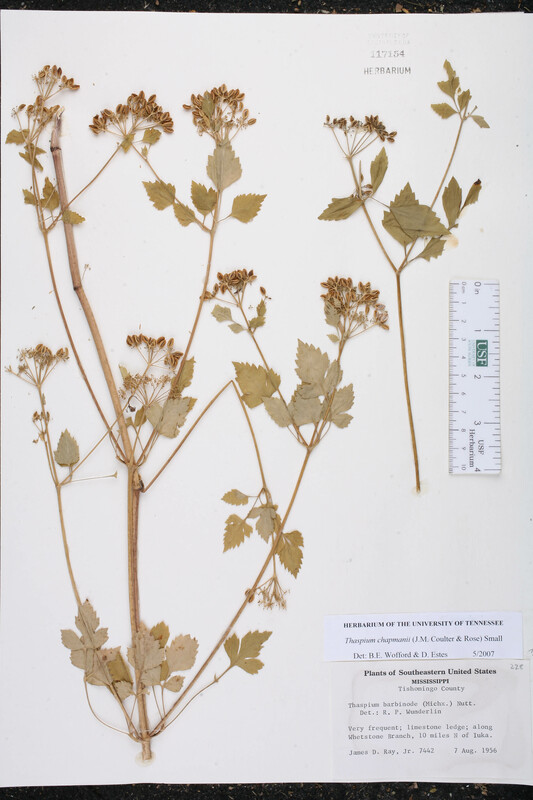 BASIONYM: Thaspium barbinode (Michaux) Nuttall, var. chapmanii J. M. Coulter & Rose 1900, nom. illegit. 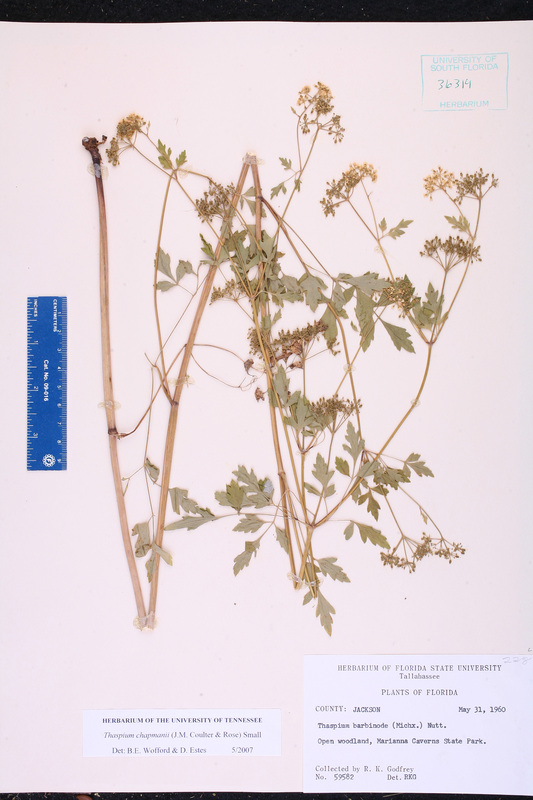 ; Thaspium barbinode (Michaux) Nuttall, var. 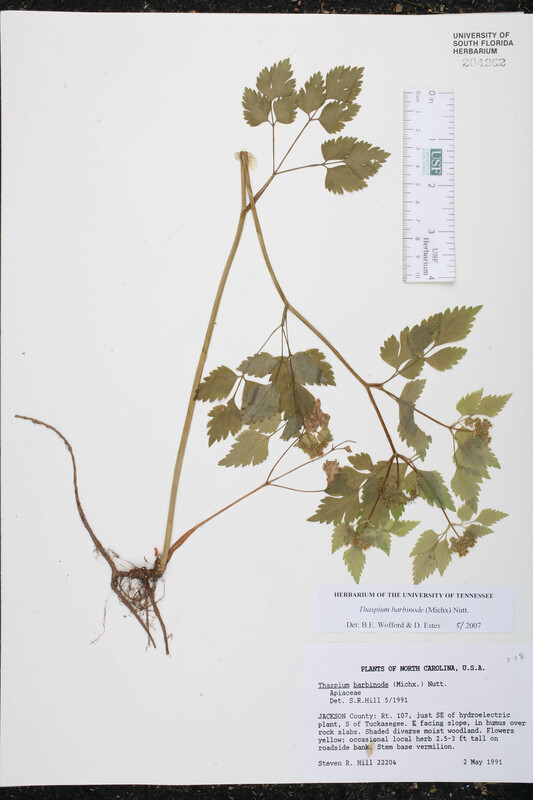 pinnatifidum J. M. Coulter & Rose 1888. Thaspium barbinode var. angustifolium Thaspium barbinode (Michaux) Nuttall, var. 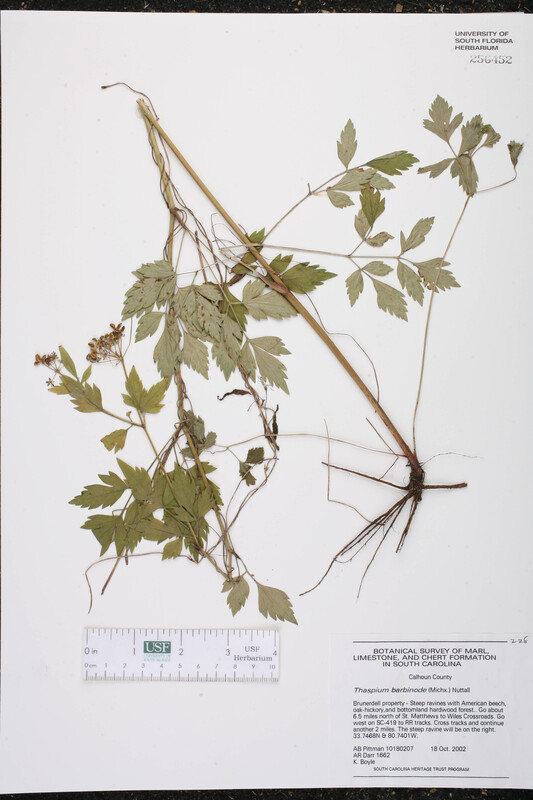 angustifolium J. M. Coulter & Rose, Bot. Gaz. 12: 137. 1887. TYPE: INDIANA: Montgomery Co.: Crawfordsville, Jun 1887, Rose s.n. (holotype: US). Thaspium barbinode var. 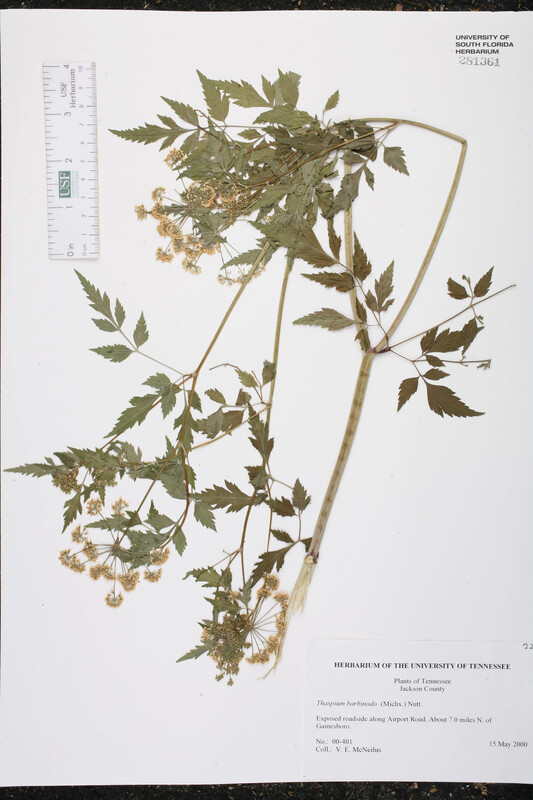 garmanii Thaspium barbinode (Michaux) Nuttall, var. garmanii J. M. Coulter & Rose, Contr. U.S. Natl. Herb. 7: 148. 1900. TYPE: KENTUCKY: Fayette Co.: Kentucky River near Lexington, 15 Aug 1895, Garman & Rose s.n. (holotype: US).